John Ross. Credit: Mark Conezny, USA TODAY Sports. The Denver Broncos are in need of more playmakers on the offensive side of the ball. They can find some in the draft, sure, but one interesting name which has surfaced recently is John Ross. Ross, a two-year veteran wide receiver from Cincinnati, is now on the trading block. And Denver should certainly be interested. The Broncos are already quite young at the receiver position, trading away veteran Demaryius Thomas last year for a fourth-round pick while allowing rookies Courtland Sutton and DaeSean Hamilton to grow with experience. However, Denver has a huge decision coming up on Emmanuel Sanders; pay him $10.25 million to play this year or waive him and incur a $2.7 million hit against the cap in dead money. Sanders is still a top-notch receiver, but at 31 years old and coming off an achilles tendon tear, it’s up in the air whether he’ll regain his stride as an elite receiver or slowly decline. Meanwhile, Ross is a speedster — running the fastest-ever 40-yard dash of 4.22 seconds in 2017 during the NFL Scouting Combine — who’s been underutilized in Cincinnati. With the Bengals, Ross didn’t catch a single pass as a rookie, dealing with a knee and then shoulder injury, which cut his season short. Last year, Ross was targeted 58 times, catching 21 passes for 210 yards — somewhat meager stats — but his seven touchdowns are certainly eye-popping. Pro Football Focus graded him out at 49.4, which made him the 217th-best receiver in the NFL last year. In Cincinnati, they likely believe the former first-round pick (No. 9 overall) is a bust. 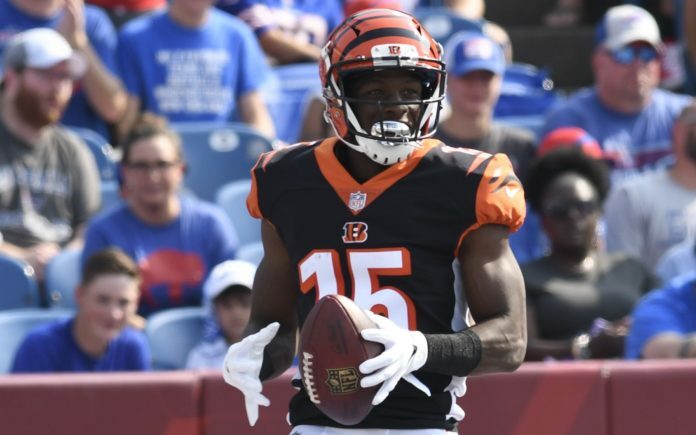 But, considering how deadly he was in the red zone, while being underutilized by the Bengals, there’s hope Ross could blossom into a star with a change of scenery. 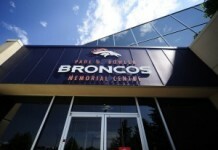 Rich Scangarello is set to revolutionize the way the Broncos offense has been functioning as of late, even if that means going back to the days of the west coast, play-action heavy offense of the Broncos’ glory days. While Bill Musgrave couldn’t adapt his offense to best suit his playmakers, there’s hope Scangarello could do just that in 2019. Giving him an incredibly athletic — and raw — receiver like Ross would in turn give the Broncos a second x-factor on the offensive side of the ball, coupling him with Phillip Lindsay. Plus, Ross, Sutton and Hamilton could at once compete, but at the same time possibly meld as a group, giving Denver a deadly receiving corps in the near future. While he’s certainly not as polished a receiver as Sanders is, Ross would come at a fraction of the price of Sanders, too. 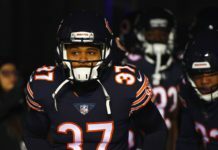 Ross is set to make just north of $2 million this season as part of his rookie deal, and he’d be locked up through 2020, too. Waiving Sanders — even with that dead money — and trading for Ross would simultaneously make the position group younger and save the team slightly more than $4 million which they could use elsewhere, filling one of their other numerous voids. Or, considering Ross would come so cheap, they could keep Sanders and Ross, moving Sanders down into the slot and letting Ross run outside opposite of Sutton. 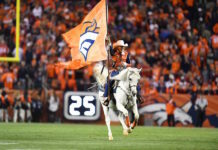 Of course, considering his scoring ability and his crazy speed, many teams will be interested in trading for Ross, so John Elway and the Broncos will have to strike quickly if they hope to land him. If they do, pairing him with Joe Flacco would not only make the veteran quarterback happy but also give him another scoring threat to throw the ball to.